The nation’s largest used car dealer, AutoNation, is adopting a Hyundai Assurance like program that alleviates some of the uncertainty people are having about their jobs. Hyundai pioneered a program that would let laid off consumers to return a car back to the manufacturer within the first 12 months of ownership, provided three months of payments were made first and a maximum of $7,500 in losses were covered. The AutoNation program will do something similar. Under their program, monthly car payments up to $500 will be covered for six months if the buyer becomes unemployed. The buyer must at least make the first three payments; the offer expires within 12 months of purchase, and the insurance only covers up to $3,000 in losses. The other big difference is that the Hyundai program doesn’t hurt one’s credit. The AutoNation program can negatively affect one’s credit if, after six months, the person still cannot make payments. What’s interesting about all of this is that even used car dealers are realizing the impact the original idea from Hyundai is having on the American psyche. 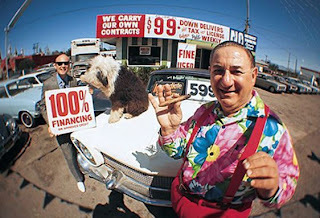 So, why not help used car shoppers by easing their confidence issues? I’m beginning to wonder if this isn’t the new way to buy any car? Also, the bigger question is does this type of program bring more buyers into market? Or is it just helping usurp buyers from other brands in the existing market? My guess is that it is bringing more buyers into the market, as there are probably a lot of potential sales sitting on the sidelines as people assess how severe the downturn will be. The good news is that the stock market is thinking it may have hit bottom last week and Ben Bernanke’s recent interview on 60 Minutes gave the nation a relief when he said the recession would end in 2009. All of this is helping to build confidence and programs like Hyundai’s and AutoNations’s are just helping bringing people back into market earlier as they are able to worry less about job security in the near term. Also, you may find other interesting content in the Links I have included on this site. The Links section is the last section on the right-hand column of every page. Latest news about online business with Maintenance Programs . Thanks for sharing great post for Dealer's Choice USA endeavour by offering pre paid maintenance programs to assure customer's assets in the form of Service contracts.